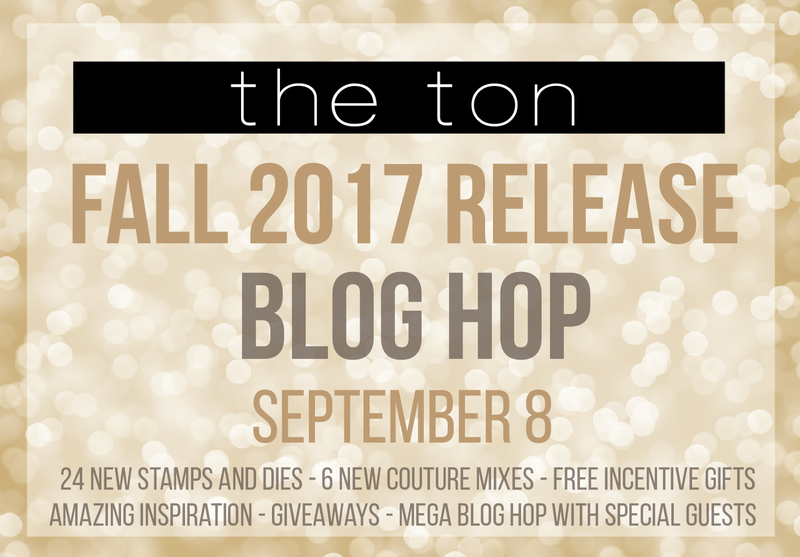 Welcome to the The Ton's Fall 2017 Release Blog Hop! It's Dana here and I'm so honored hopping along with amazingly talented designers. I hope you are from Isha's blog, but if you lost your track or firstly stop by here, please check the full hop list in the bottom of this post. Ok. It's time to getting to my cards. September is perfect season to start prepare Christmas card and I have 4 holiday cards to share with you today. Let's get started! For my first card, I started by ink blending the background with distress inks on A2 sized card base. I splattered white acrylic paints with water here and there and drew more snows with gel pen. I trimmed white woodgrain card stock and foam mounted them on the card base as shown in the picture. 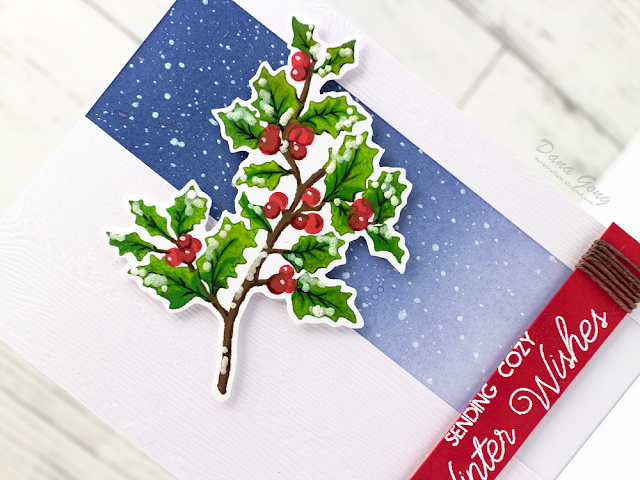 I stamped each layers of branch image from The Ton Holly Branch Stamp set with dye inks. I added some details to the branch, leaves and berries with copic markers. I then applied Marvy snow marker over the image and heat embossed it. I white heat embossed sentiment from same stamp set on a piece of red card stock. By form mounting branch and sentiment banner, I finished this card off. I started by creating the door texture with my paper trimmer and scoring folder. It's not complicated. 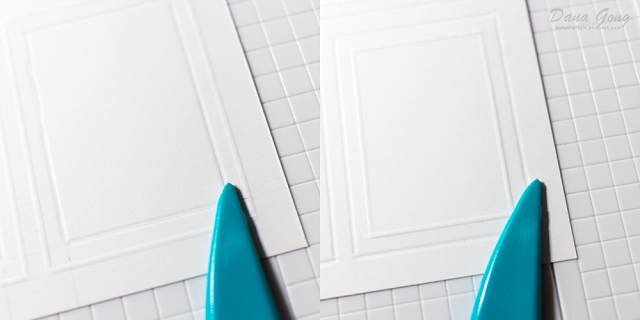 I scored 2 small rectangles and 1 large rectangle 2 times on both sides of A2 sized card stock. Next, I stamped layered wreath images and other elements from The Ton Christmas Wreath Builder Stamp Set using dye inks. I then trimmed images using scissors and foam mounted them on the door. I white heat embossed sentiment from same stamp set on dark grey card stock and glued sentiment panel on the bottom of door. Then, I mounted door panel to the white card base. When you opened the door, you can find beautifully decorated fireplace in my home! To start, I die cut small rectangle from white card stock to create fireplace. I then stenciled bricks using Ranger texture paste. 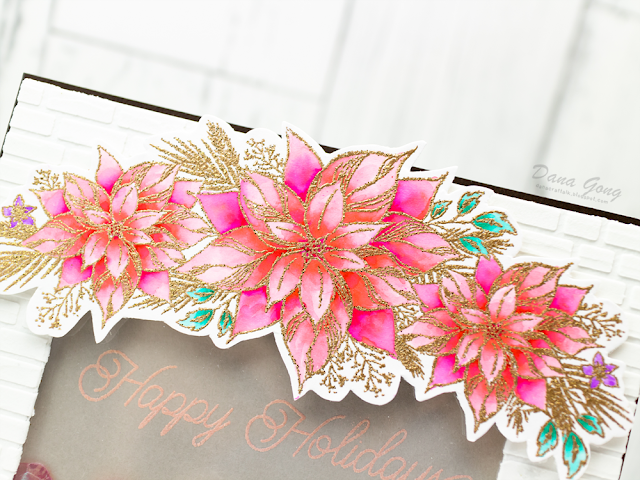 While dried it completely, I gold heat embossed flowers from The Ton Cozy Poinsettias Stamp Set and colored them with Zig clean color real brush markers. I trimmed it using scissors. I stamped sentiment on a piece of grey card stock and heat embossed it with The Ton Rose gold embossing powder. I mounted it on dark brown card stock and made shaker using lots of foam tape and acetate. To finish it off, I foam mounted poinsettia flowers where I wanted them. I glued dark brown panel with fireplace on A2 sized white card base. My little story is finished now, but I'd like to share one more card making with 3 stamp sets I used today, The Ton Cozy Poinsettias Stamp Set, Christmas Wreath Builder Stamp Set, Holly Branch Stamp Set. I stamped poinsettias from The Ton Cozy Poinsettias Stamp Set onto red card stock and heat embossed with Ranger Snowflake tinsel embossing powder. I then colored them with Prisma Metallic Accents. For background, I randomly stamped poinsettia flower from The Ton Christmas Wreath Builder Stamp Set using Versamark ink. I heat embossed them with clear embossing powder to get tone-on-tone look. 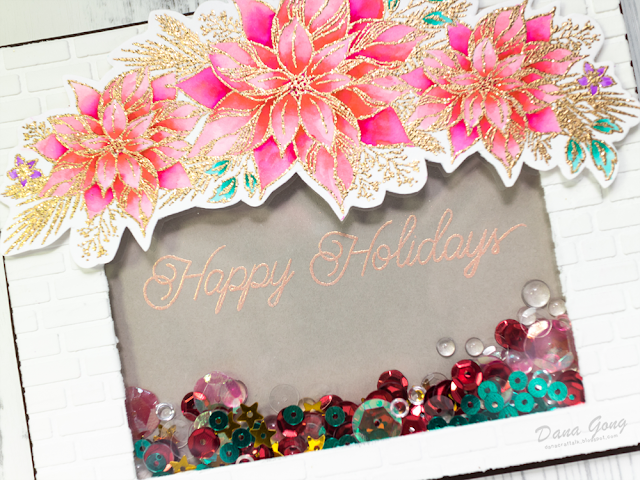 I glued clear embossed panel to light grey card stock and foam mounted poinsettias as shown in the picture. For sentiment, I gold heat embossed it from The Ton Holly Branch Stamp Set on vellum and cut it out using circle die. I then mounted it on the red panel using clear foam adhesive. To finish, I glued light grey panel to A2 sized kraft card base. I hope you enjoyed these cards and got some inspirations. Your next stop is amazing Lisa's Blog. Thank you so much for stopping by and happy hopping! + The Ton has 24 new stamps, coordinating dies and 6 Couture Mixes for their new Fall 2017 Release which includes up to three free gifts with purchases. For more information on The Ton’s incentive gifts, head over to The Ton’s blog. All new release products are available now! Love all your cards! The shaker card is so pretty. 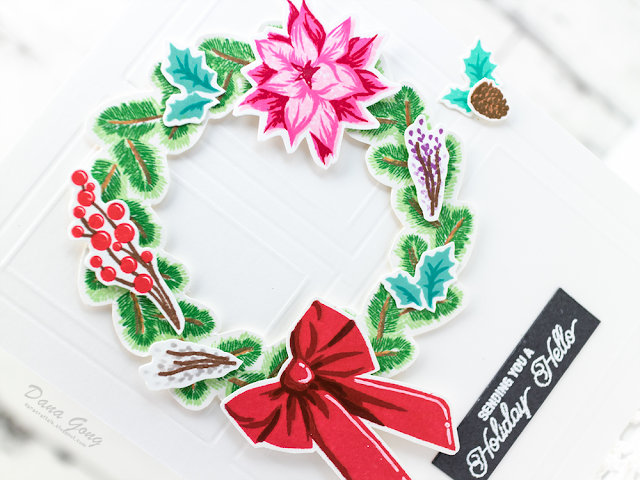 That Holly stamp set is one of my favourites from this new release (next to the magnolia one)! Thanks for all the inspiration. I love our designs. Another fabulous release by The Ton. Beautiful cards, all of them! TFS! All of the cards are nice, the shaker is an added bonus to creativity. I love all your cards using the new release stamps. So much inspiration! Thank you! 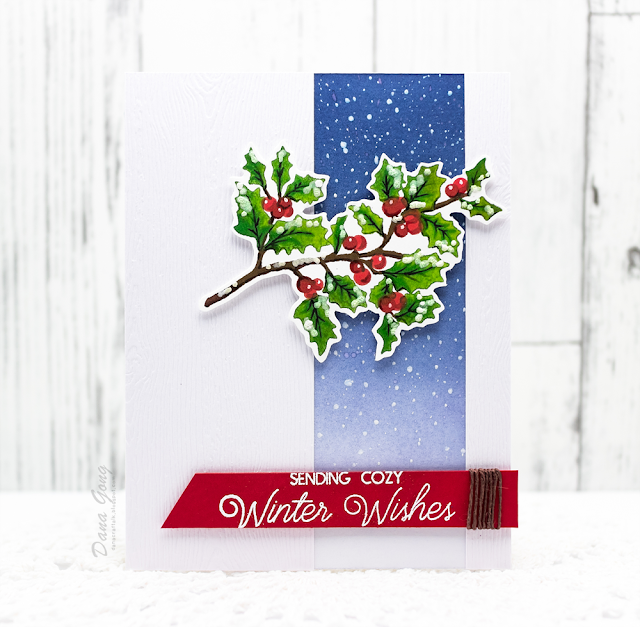 love how you used the holly branch! Love your shaker card. Thanks for sharing. Beautiful creations, I adore that shaker card! all of your cards are marvelous, but I LOVE the red poinsettia card! Dana your cards are outstanding. I love that shaker card. Beautiful and awesome all in one! These are all beautiful Dana, your shaker is spectacular! I really love the holly! I so love the holly and i thank you for the scoring tips. Thank you for sharing. Beautiful cards. Love getting new ideas. Beautiful cards!! The holly card is so pretty!! I love the door. Looks so perfect for the wreath. The wreath is gorgeous!! I love shaker cards. Yours is stunning with the poinsettia. Love the last card. The poinsettia background adds a nice touch. Fantastic cards. 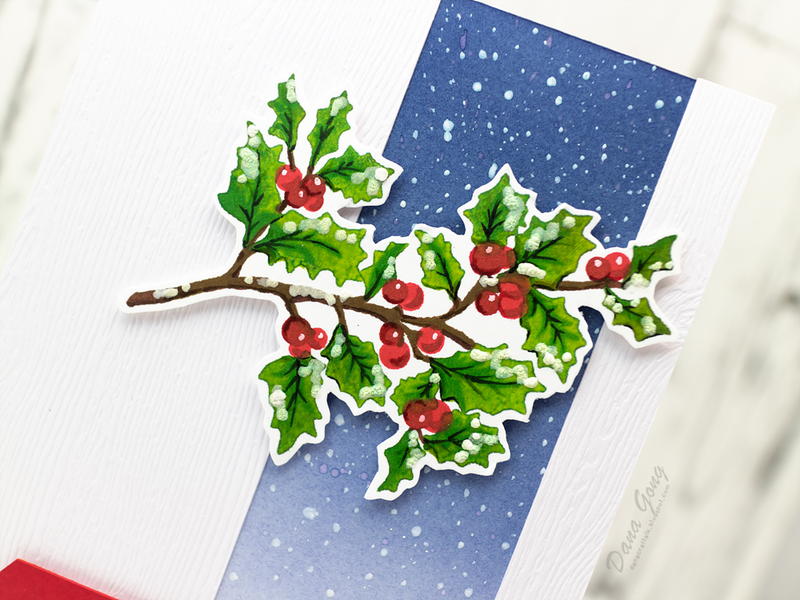 Especially love the holly with the blue background. Great coloring of the cozy poinsettias. I liked the way you colored on red card stock - that's a good tip to use metallic paints on a darker card stock. Absolutely amazing cards, I love them all. These are beautiful cards. I like the holly branch against the snowy sky strip. The red and silver embossed poinsettia card is stunning. All your cards are stunning! They just got more gorgeous as I scrolled down. Thanks for sharing your talent. Love love love your work. The cards are unique and so creative. Thank you for sharing them! Absolutely beautiful bundle of cards!! I really love the shaker card. LOVE them ALL, from your scored door with the pretty wreath and the holly branch across the snowy window to the delightful poinsettia shaker and elegant "cozy" poinsettias ... SO MUCH to LOVE, feeling SO INSPIRED! Stunning cards! They're all so beautiful! Wow wow wow and wow!! All are gorgeous! These four cards are really beautiful but my favourite is the Winter Wishes card, with the fading from dark to light blue and the twine wrapped around the sentiment strip. Thanks. Your cards are stunning. Thanks for sharing your talent. 4 absolutely stunning cards!!! Thanks for sharing! Beautiful cards. I love the holly! Dana, your projects are wonderful!!! Lovely cards. The Ton has put out a fantastic release! Your cards are beautiful and I think it's very clever how you turned your card base into a door and your fireplace into a shaker. Very unique and lovely designs. Love these fabulous and clever designs Dana! Thanks for all the inspiration! Have a wonderful day! So many cool ideas! I love the snow strip on the side and the pretty poinsettias with a brick wall shaker! Wonderful cards you created with these products. I absolutely love the card you made with the holly in front of the blue panel with snow coming down on it. I love the colors you chose and how it all pops against the white background. Everything about it is wonderful! Your wreath card is so sweet. I love the colors you chose for it, as well. 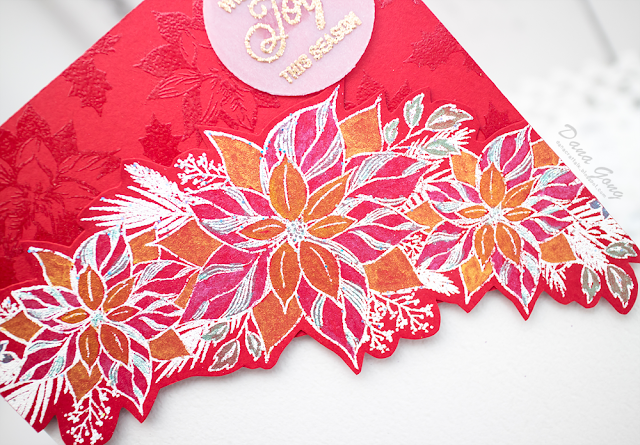 I love the idea of using embossing paste to create a fireplace background for your first poinsettia card. They look wonderful embossed in gold and in white on the red background! Gorgeous cards! I especially lover that beautiful holly branch! Lovely coloring and added texture! Fabulous cards! 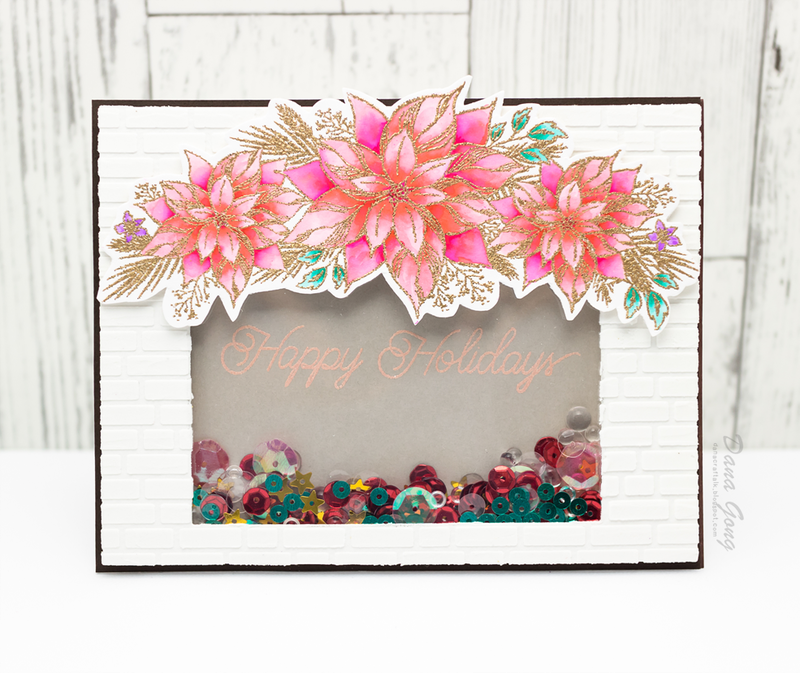 The design on the cozy poinsettias cards are fantastic! All of your cards are gorgeous! Your cards are very unique and beautiful. Beautiful cards. My favourite is the first one with the gorgeous ink blended panel. Awesome backdrop for the holly. Lovely designs. Stunning cards. Just loving this release! So many great stamps. I love all your cards and your great color choices. FABULOUS!